These flowers are gorgeous! They are beautiful in all the colors. These decals would look great in any nursery, bedroom, bathroom. This decal measures 38" wide by 28" tall when arranged as shown, but you can arrange each of the flowers however you please to cover a larger area, if desired. The decal will come in your choice of colors. 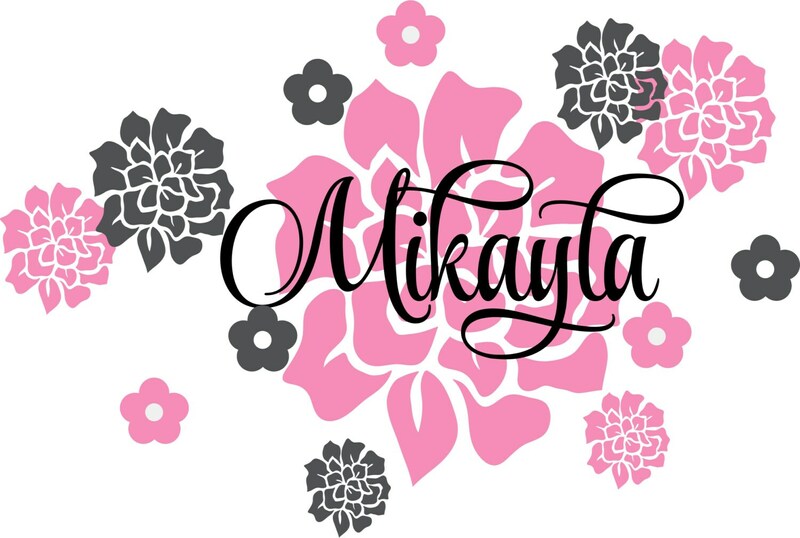 You can order the decal either with or without the name. Please see the drop down menu for ordering options. The flower colors shown in the first photo are Dark Grey and Lipstick. The flower colors in the 2nd photo are Soft Pink and Dark Grey. Please see our color chart in the 3nd photo. You will receive all the flowers as shown in the photo in your choice of colors. The colors matched my daughter's room perfectly.